Given the Chapel’s three venues, we can accommodate anything from small, intimate weddings to parties of 300. Our wedding packages offer an array of options, including traditional and non-traditional wedding ceremonies, vow renewal, and commitment services. You can also host your reception in the Chapel’s spacious Fellowship Hall if you wish. 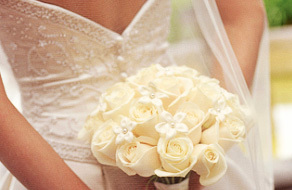 The Wedding Coordinator is available to assist you with the scheduling, planning and coordination of your special day. For larger weddings, a rehearsal helps your ceremony run smoothly; please invite the entire wedding party to attend. Remember to bring your marriage license! It is very important that you schedule your rehearsal at the time you schedule your wedding to insure Chapel availability. Since we often have more than one wedding on the same day, it is important that the wedding is on time. You will be able to set up for your wedding one hour before the ceremony. Please keep this in mind when planning your decorations or flower delivery. We will make every effort to work with you regarding the schedule, however, we must respect the schedule of other services at the Chapel. In keeping with the sacred nature of a wedding at Longboat Island Chapel, flash photography is not allowed during the wedding ceremony. There will be sufficient time for taking pictures before and after your ceremony. We ask that your photographer take available light photographs and be as discrete as possible during the ceremony. Flash pictures may be taken during the processional and recessional. When you contact the Wedding Coordinator, she will check the Chapel calendar for the availability of your requested wedding date. Please complete and submit the Reservation Form that can be found on www.longboatweddings.com. 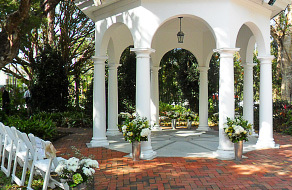 The Chapel Wedding Coordinator is available to assist you with the details of your wedding. The coordinator will insure that all aspects of your “special day” go smoothly. The www.longboatweddings.com website also has a list of florists, soloists, instrumentalists, photographers, etc. that the Chapel has successfully worked with in the past to assist you in planning your special event.